The opening credits in Mario Hoops 3-On-3 are possibly the shortest encountered so far. After clicking the "Matchups" option on the main menu, "DS Download Play" is one of the two options. "Multiplayer" would've been better than "Matchups" because the other options ("Challenges" and "Exhibition" and "Tournament") all can be construed as multiplayer. Download time is long, but there's a lot in the download packet. Menu options are large and have sufficient buffer space in between options. The game is set up pretty well and the controls are fairly intuitive. The movement, for example, is based on the direction pad, and it functions exactly as you'd expect it to. There are a few odd programming decisions, though. The most obtrusive of which is most prevalent in Coin Hunter. Want to throw a shell (or other throwable item) in a direction opposite the screen? Swipe the stylus upward. Want to make your character jump up? ALSO swipe the stylus upward. That becomes a problem. Also annoying in Coin Hunter is that aspects of the camera have to be controlled separately. Camera work in 3D environments is a problem for more than half of the 3D games on the market, and at least there is A solution here. The content in Mario Hoops 3-On-3 is nice, but lacking. Dribble Race is a fun mini game, and Coin Hunter, more of a direct deathmatch-styled mini game, is even more fun. There are a lot of glaring omissions, however. Even if the game isn't set up to stream a complete basketball game, there are no basketball-related mini games attached to this basketball game. There's no shooting contest (like HORSE). There's no dribbling competition. There's no trick dunking competition. In fact, the basketball itself doesn't even show up in Coin Hunter at all! That aside, both mini games are set in full 3D environments. The sound really helps set the move and, in some cases, serves as an early warning system (shell's-a-comin'!) to give you time to move. Mario Hoops 3-On-3 is unique. It's non-traditional basketball accounts for the only serious attempt at a basketball game available on the Nintendo DS, a system that has sold over 70 million copies (so far). (I said "Serious" attempt, so the Harlem Globetrotters title doesn't count.) Still, much about the title IS non-traditional. In the Single-Card Download mini games (the part of the title reviewed here), the trend continues. After all, as a MArio sports title, it's hardly expected to be traditional. The game contains two Single-Card Download mini games. The first one, Dribble Race, has you dribbling a basketball on Question Mark Squares to get coins and then heading for a finish line. The second one, Coin Hunter, is a deathmatch-styled game that is based on throwing things (like shells and banana peels) at opponents and basketballs don't even make an appearance. Both of the mini games in Mario Hoops 3-On-3 provide what I found to be fun, unique challenges. They're not rehashes of other games (or other mini games) and are programmed well. I found Coin Hunter to be more fun, since it was head-to-head and there was more direct interaction with your opponents, but I enjoyed Dribble Race as well (which was much more challenging on Sunshine Road than it was in Peach's Castle). While both of these mini games are fun, neither one is focused on basketball. There was a missed opportunity with this title. Why no Mario-themed game of HORSE? A lot of titles go with mini games and don't stream the main, full game (very few do), but I was sad to see a lack of more basketball-themed mini games, even if they weren't traditional. In the end, though, what's there is fun, programmed well, and does in fact give a idea of what the main game is like (moreso Dribble Race than Coin Hunter). I'm hoping a sequel will be announced eventually but, in the meantime, this one will continue to make it's presence in my collection known from time to time. Change "Matchups" to "Multiplayer" on the main menu. Add in Single-Card Download mini games for shooting contests (like HORSE, for example), fancy dribbling, and other basketball-related activities. Stream a full basketball game. 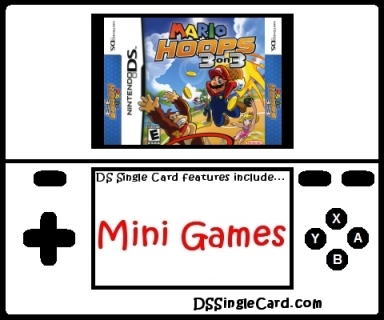 Click here to return to the DSSingleCard.com Mario Hoops 3-On-3 profile.